Arbor, scientific name: Lagetstroemia speciosa, 7-25m high. The bark is gray and smooth. Branches cylindrical, glabrous. Leaves alternate or subopposite; petiole 8-10 mm long, stout; leaf blade leathery, elliptic or ovate-elliptic, lanceolate, 10-â€“â€“â€“â€“â€“â€“â€“â€“â€“â€“â€“â€“â€“â€“â€“â€“â€“â€“â€“â€“â€“â€“â€“â€“â€“ Wide-branched to round, both sides glabrous; lateral veins 7-17 pairs, sessilely connected at leaf margin. Flowers reddish or purple, 5cm in diameter; terminal panicles 15-25cm long, arranged in tower shape; peduncle 1-1.5cm long, dense yellow-brown felt; calyx with 12 longitudinal or longitudinal grooves, scorpion-like hairs , about 13mm long, lobes triangular, recurved, inner hairless, in addition to body scales to a big debate; petals 6, nearly round or obovate, 2.5-3.5cm long, few shrink, short claws, about 5mm long Most of the stamens, up to 100-200, inserted in the middle and lower part of the fistula; ovary globose, 4-6 locule, glabrous, 2-3 cm long, longer than stamen. Capsule obovate or globose, 2-2-3 cm long, ca. 2 cm in diam. Most seeds, 10-15mm long. Flowering period from May to July, fruiting period from October to November. 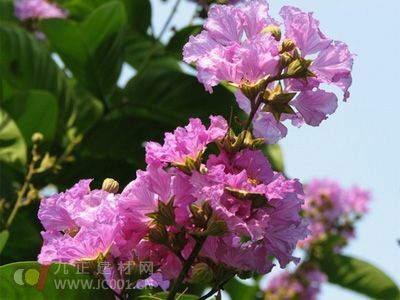 Large deciduous trees, 6-12 (15) meters high, dry and upright, dark brown bark, many branches, branches, round umbrella. The leaves are large, 10-70 cm long and have short handles. Single leaf opposite, elliptic, long ovate to oblong, ca. 20 cm long, apex acute, entire; 5--8 months flowering, panicles terminal, flowers purple, large flowering, ca. 5-7 cm. 6 pieces of lavender petals, the edges are irregularly wavy; the capsules are spherical, with a diameter of about 2.5 cm, mature in autumn, brown when mature, and split into six pieces. Calyx has ribs and scaly pilose; summer and autumn flowering.